Recent release “The Power of His Resurrection Jesus” from Page Publishing author King Chuck is a heartwarming account that ministers the reader’s perspective with the knowledge and wisdom of God’s glory and purpose. King Chuck, a devoted follower of Jesus Christ, and a passionate writer, has completed his new book “The Power of His Resurrection Jesus”: a stirring narrative that declares the divine benevolence of God, as supported by his promise of salvation for all nations of the world. “Being in God’s presence is real. It is a privilege to be in his very presence. The overflowing joy is evidence of God’s divine presence out of bodily experience with a message. No one can describe fully in human terms (Ps. 16:11). Published by New York City-based Page Publishing, King Chuck’s inspiring book shares God’s word in a profound way, leading to blessings, miracles, and healing of the body, mind, and spirit. 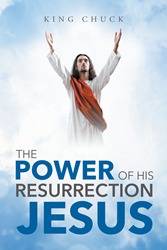 Readers who wish to experience this uplifting work can purchase “The Power of His Resurrection Jesus” at bookstores everywhere, or online at the Apple iTunes store, Amazon, Kobo, Google Play, or Barnes and Noble.